The New Homestead's professional physical, occupational and speech therapists work with our residents and their families to develop an individualized therapy program. OUR GOAL is to return residents home! "Get Better! Get Home! Focused Rehab helps you recover from illness, accident, or surgery and consists of three rehabilitation disciplines: physical therapy, occupational therapy, and speech-language pathology. Physical Therapy (PT) focuses on evaluating, diagnosing, and treating disorders of the musculoskeletal system. PT helps you restore functional skills in a variety of areas such as muscle strength, balance, and mobility. Occupational Therapy (OT) is recommended when your ability to live independently and to participate in community, work, and family activities is interrupted by illness and injury. OT focuses on helping you with daily activities such as dressing, grooming, bathing and eating. Speech-Language Pathology (SLP) concentrates on voice quality and swallowing disorders. SLP is often recommended when you have difficulty communicating or understanding others, have difficulty reading or understanding the written word and/or have problems swallowing food or liquids. With patients recovering from orthopedic surgery and other major medical procedures, post-operative care and rehabilitative therapy are a fact of life. You want patients to get better and you want them to get home. That’s why there is focused rehab at The New Homestead. At the New Homestead, the patients work with specially-trained therapists in a comfortable, hometown setting. From physical and occupational therapy to speech therapy, our therapists will work closely with the patient to develop a rehabilitative care program tailored to meet their specific needs. We offer private rooms along with separate dining and living areas. Our patients enjoy the benefits of cable TV, private phones and internet access. Every facet of Focused Rehab is designed to support a personalized, comfortable rehabilitation experience that gets patients better and gets them home as quickly as possible. A lot of rehabilitative programs offer a production-line approach to patient care. That’s why sub-acute patients nationwide have a 30 day average length of stay following an orthopedic procedure. At The New Homestead, we have one primary goal: getting patients better and getting them home as quickly as possible. 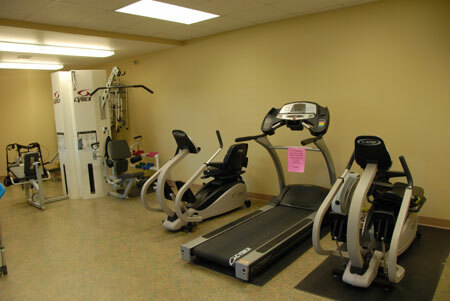 To learn more about Focused Rehab at The New Homestead or to make a referral, call us today at 641-332-2204.